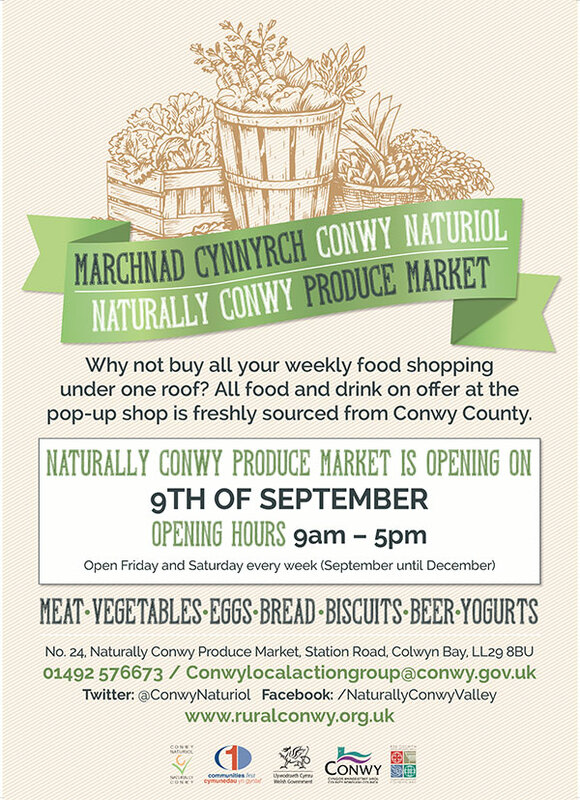 ‘Naturally Conwy’ Set to Open! Colwyn Bay Townscape Heritage Initiative are very excited to announce the launch of a brand new initiative: ‘Naturally Conwy’! This project involves using the existing Pop Up Shop at 24 Station Road, and producers will be given a four month tenancy; the new shop is set to open on Station Road on the 9th of September. ‘Naturally Conwy’ is a collaboration between Colwyn Bay THI, Communities First, Rural Development Team and local food producers. The shop will sell produce made locally within the county of Conwy, including shortbread, cake mixes, ready-made cakes, fresh fruit and vegetables and meat as well as beers and gins and other food. Seasonal offerings of pumpkins around Halloween and Christmas puddings in December are also expected to feature. From early September, fourteen producers who are all from and produce food and drink in the county of Conwy, will team up and work together to highlight, showcase and sell their produce. Most of the producers will man the shop on a rota basis but the butchers will be there full-time as they are required to handle the raw meat. The shop will open every Friday and Saturday (09:00 – 17:00) until the end of December. Rhys Evans, of Conwy Cynhaliol, said: “The idea was first discussed in June and the producers, who are all members of the Conwy Food Forum, were very enthusiastic. Through working with Colwyn Bay Townscape Heritage Initiative and the other partner organisations, the producers will take over the shop in the town centre to sell directly to customers without losing income to third parties, and shoppers who purchase items from the shop will be supporting their local economy. In a bid to raise awareness amongst local businesses and encourage more local produce to be sold in local eateries, restaurants and hotels from across the county will also be invited to come to meet the producers and taste the food. Cllr Dilwyn Roberts, leader of Conwy County Borough Council, will cut the ribbon on the opening day. Colwyn Bay Townscape Heritage Initiative ran from 2012 to 2017, the project is now closed.